Mobius Radio by Crazy Idea Development is an Internet radio service that offers free music. If you use Internet Explorer, Mozilla Firefox, or Google Chrome, it will take over your Internet browsing experience with a stream of ads. They might come in any form, from banners to intrusive pop-up ads. While it does work as a source of music, it comes with the price of massive annoyance. If you would like to remove Mobius Radio from your computer, we can’t help but agree with your choice. Like with all adware, the ads shown by Mobius Radio are tailored especially for you. It’s made possible by the information it gathers about the websites you visit, things you click on, and items you buy on the Internet. It’s all done in an effort to make you click as many ads as possible, because the income of Crazy Idea Development depends on it. This model of payment for advertising is called pay-per-click. The developers justify this tactic by stating that they're trying to make up for the expenditures of making the service possible, acording to the page About Us on their website. There are many ways to catch adware; however, Mobius Radio is known to come from its website, or bundled with other programs. We must warn you that Mobius Radio is known to accompany programs that can be classified as malware – malicious programs that can get onto your system without your knowledge, where it could do real damage to your machine or steal your personal information, among other things. To be fair, though, we have to mention that while disruptive and annoying, Mobius Radio is not dangerous by itself, and needs your permission to get onto your computer. If you do not remember installing this program, it’s likely that you breezed through while installing some kind of free software, giving the setup program permission to install Mobius Radio. You can never be sure what else came with this program. As in vast majority of cases concerning adware, the only real harm to your system could come if you click an advertisement that redirects you to a dodgy website that hosts dangerous threats. It’s always smart to avoid websites you do not know to be 100% trustworthy. To be perfectly safe, you should probably avoid the temptation of clicking something altogether by getting rid of Mobius Radio. While Mobius Radio is not a hard program to terminate manually, we think that getting a professional anti-malware tool is always a good idea. 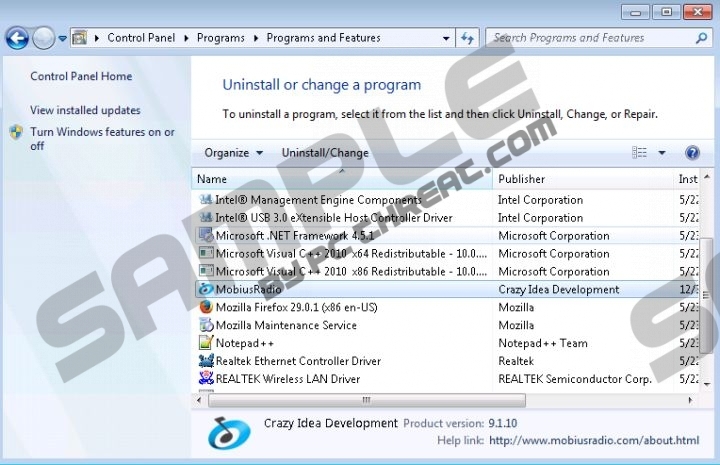 It can uninstall Mobius Radio for you and eliminate any other malicious software on your computer, which might come in handy if you didn't download this program from its website, as well as offering real-time protection. If you insist on removing it yourself, the instructions are below. Select and click Control Panel. Select Mobius Radio on the list of programs and click the Remove button. Right-click on Mobius Radio and click Remove. Find and click Control Panel in the pop-up. Quick & tested solution for Mobius Radio removal.